Pre hike preparations, sponsor mentions, getting through immigration and reaching the trailhead. 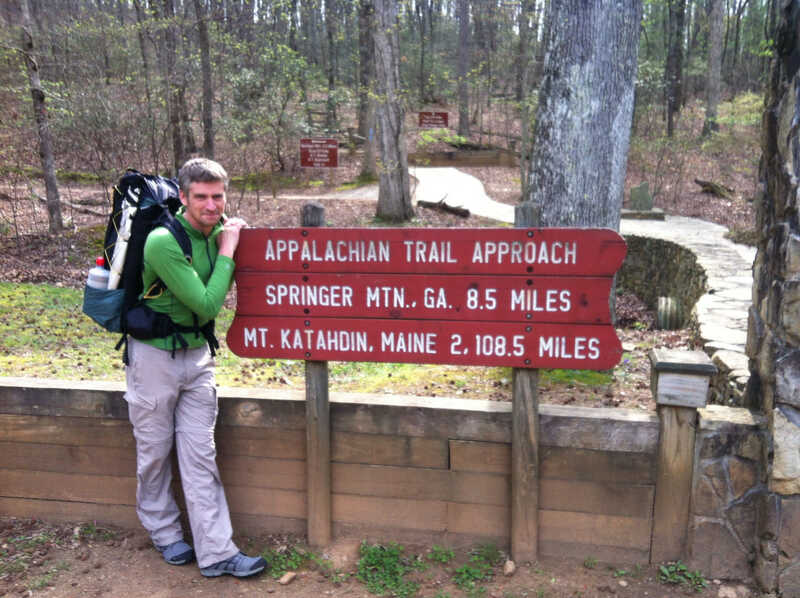 Welcome to my blog of The Appalachian Trail which I thru-hiked in 2012. All my posts, photos, videos and more from the trip will be right here. Come with me! 20th Feb 2012 – Once in a Lifetime? 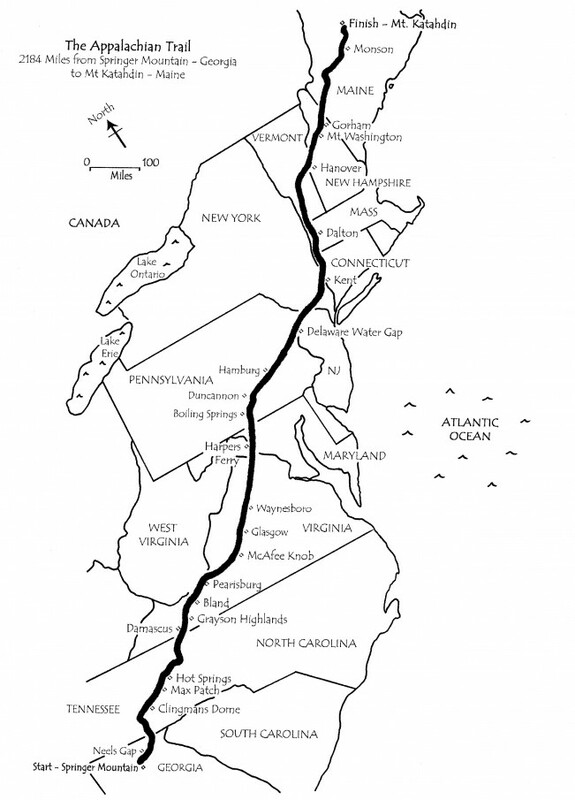 In the Spring of 2012 I set out to thru-hike of the Appalachian Trail (AT). This 2,180 mile route starts at Springer Mountain in the state of Georgia and finishes on the summit of Mount Katahdin, in Maine. It winds its way north through the eastern states of America and will take about five to six months to complete. Why? Why not?! My original plan before I walked the Pacific Crest Trail in 2010 was actually to attempt the AT. I only changed my mind a couple of months before because I thought I would only get one chance to do a long distance walk, and if I did only have one chance, which one would I do? The PCT was my choice. Now, I realise long distance hiking is definitely my thing. Apart from my other adventures, the PCT was a once in a lifetime adventure. Why do we only have to have one?! Those of you that have read my books know that my train of thought is that life is for living and to hell with the consequences. If I hit 65 with no pension and no house but I have lived, then I will be a happy man. The other thought that keeps cropping up is the Triple Crown. Walk the Pacific Crest Trail, the Appalachian Trail and the Continental Divide Trail and you can call yourself a Triple Crowner, an accolade very few can lay claim to. Well, now I want that as well and after that, I want more. 1,375 miles into my AT thru-hike and I will be half way to that goal. Finish the AT and then knock off the Continental Divide Trail and I will be a Triple Crowner. What next? Hmm, I think I nice little ramble around 4000 miles through Europe would be sweet . . . I will update when I can and post photos and video as well. I have some new sponsors who deserve a mention and will bring you news of those too. I’m very excited. 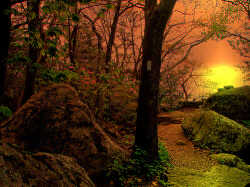 Excited about the prospect of spending 6 months in the woods, I can’t wait to be back in my hiking shoes, with my rucksack strapped to my back, to be able to make camp wherever feels right, to meet lots of other like-minded individuals and to spend that amount of time doing what I love doing in an environment where I feel completely at peace. Once in a lifetime? Nah . . . These guys are probably my favourite sponsors because they manufacture my favourite piece of kit. Trail Designs started supporting me at the start of my Pacific Crest Trail thru-hike and are also helping me out on the Appalachian Trail by supplying a Caldera Cone system to partner my MSR 1.0L Titan pot, and as a bonus they are now offering trail food. I am looking forward to some Wise Company meals and Olympic Granola Bars. The Caldera system works by suspending a pot over an alcohol burner (made from recycled drinks cans). The suspension is done by the ‘cone’, made from either aluminium or titanium. This cone acts as a stand, a windshield, and keeps a lot of heat in, which is funnelled up the side of the pot. Instead of losing valuable heat (and in turn using more fuel), it is used around the pot as well as the direct heat underneath it. This makes for a super-efficient set up with a very impressive boil time for an alcohol system. I’m not going to get into burn times because I think it’s completely irrelevant (see ‘The one complaint’ paragraph below). 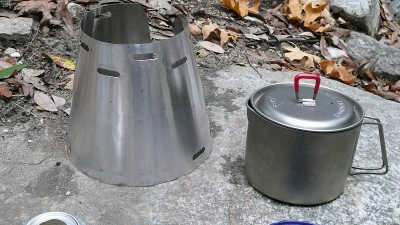 It’s a very frugal set up, on my PCT hike I would boil a litre of water. This would provide me a hot drink and the rest was enough to rehydrate my meal. All I needed to do this was a measly 15 ML / about 1 TBS. A weeks’ worth of fuel therefore weighed a tiny amount. It always started first time with the flick of a lighter, even at higher and colder elevations. The whole system is super light and compact. The real beauty though is basically its simplicity. Trail Designs also offer a multitude of other stove setups, many using recycled materials. The one complaint I hear often with alcohol systems is – ‘But they take too long to heat anything up’. This is one reason I can never fully grasp? Simply, if you’re using an alcohol based system then yes, it does take longer to cook than say, a gas canister based system. However, if you are using alcohol then you will will undoubtedly be outdoors enjoying the wilderness. So, why are you in such a hurry? If you’re still using gas, where the hell have you been? I first became acquainted with Niels Overgaard Blok when he contacted me on my Pacific Crest Trail thru-hike. He had read on my blog that I had a bad habit of breaking sunglasses and offered to send me a pair of indestructible Numa Sports Optics X-Frames. I have had them ever since and Niels continues to sponsor and help me. 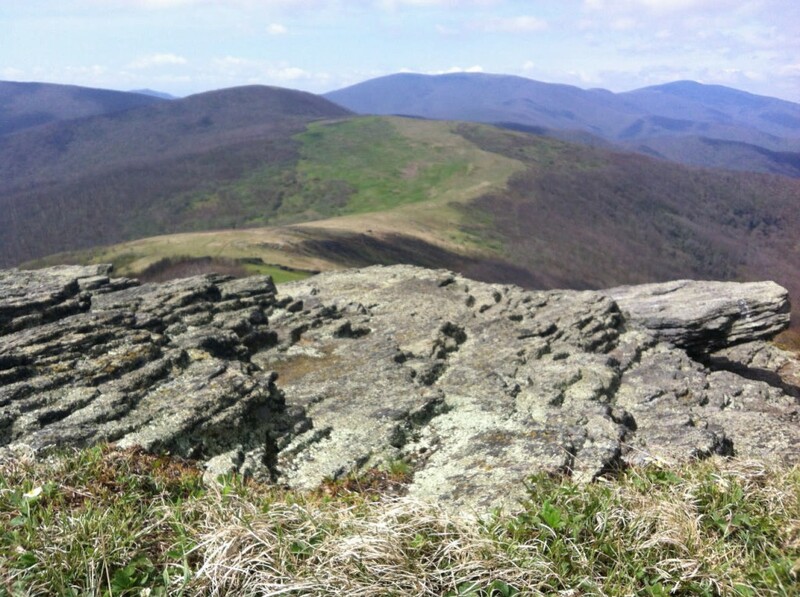 For my Appalachian Trail hike he has supplied me with a Golite Malpais waterproof jacket, a Golite Cady synthetic insulated jacket and a Golite Gillet. All will come in very handy, the Malpais is ridiculously light and the Cady jacket should be ideal for the wetter conditions I expect on the AT. Niels runs Backpacking Light over in Denmark and does to some great gear. 8th March 2012 – Flight booked and new tent ordered! Flight booked! I fly to Miami on 23rd March. There I will stay on Paradise Farms where I stayed after my El Camino walk. Gabriele, the owner, will be acting as base HQ for my hike and posting out anything I need. I also expect to get back there after, pick up my stuff but hopefully not before a little winding down. I have also ordered a new tent from a company called ZPacks. Their Hexamid Solo tent weighs a measly 250 grams! It an interesting design with mesh on the entire lower area and is designed so a groundsheet sits on top of this. The main appeal is obviously the weight, incredibly light but I have heard great things about Joe and Sheryl who hand produce these tents, as well as packs, sleeping bags and other items. This will shave of a whopping 500 grams off my previous tent, and I thought that was light! 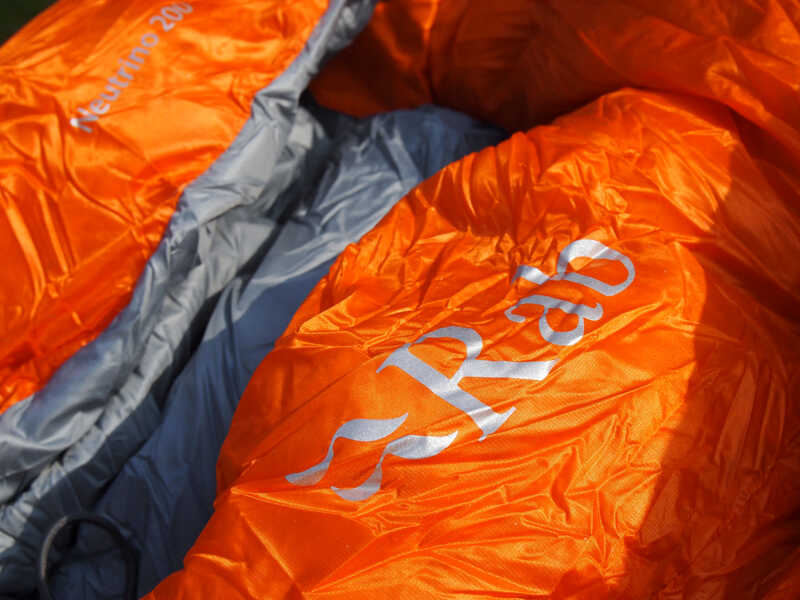 Many thanks to Dan Thompson at Rab for kindly and generously sponsoring me with all my base layers for my Appalachian Trail hike as well as a Neutrino 200 Sleeping bag. Their base layers are made from a mix of 65% ethically sourced Merino Wool and 35% recycled polyester including Cocona technology. These provide all the benefits of Merino wool (comfort, warmth and odour protection) and the Cocona means they dry 5 times faster than conventional Merino. I shall be carrying, or wearing, one t-shirt and one long sleeve layer. The Neutrino sleeping bag is a summer bag that I will use once the last of the cold weather that the AT is renowned for has passed. It is filled with down, has a Pertex Quantum outer and weighs a measly 595 gr. Rab are world renowned for their excellent gear and command a great deal of respect. 22nd March 2012 – Flight tomorrow! Well, I don’t know quite how I got there but all arrangements, save a few minor niggles are done. I fly tomorow (23rd) to Miami, where I will hook up with a friend in Homestead and sort my gear out. Next Monday or Tuesday I will get a Greyhound up to Atlanata, meet up with some PCT friends who have been kind enough to take me to the trailhead, I should be walking by Tuesday I hope. Around 6 months and 2,200 miles later I hope to be able to call myself an AT thr-hiker, and be well over half way to becoming a triple crowner. Check back for blog updates, photos and video. Plus a load of other useless stuff as well. 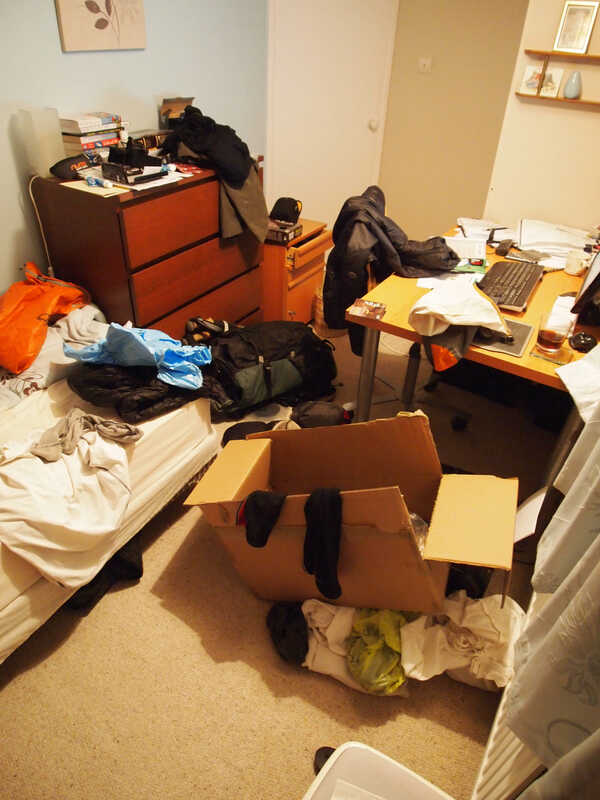 A thru-hikers room one week before flying . . . Airline Business Class, another world I never thought I’d never experience. However, with a friend securing me a cheap flight to the States through a buddy / friend system I thought I’d try my luck and ask. Next thing I know I’m all legs outstretched, eating fillet steak with a nice Rioja whilst the hostess pampers and obliges my every whim. 10 hours later and I enter Miami immigration control. “Just send out lots of love,’ was the advice I received in relation to making my immigration process smooth. I wandered up and down the long line of officials trying to find one that looked more welcoming than the others, never easy. I settled on an elderly guy with grey hair on the weak assumption that he may like walking, it was a good choice. I spent ten minutes talking to him whilst a long line of people glared at me, tapping their feet with tightly folded arms anxiously waiting for their turn. My visa was only for 6 months but he obligingly gave me 8 months, even after I only requested seven. Things were off to a great start. I spent 2 days down in Homestead, Florida at Paradise Farms where I stayed after my El Camino hike. Gabriele, the owner, looked after me in her own unique style, despite having to run the farm and hold a dinner for 96 guests. She even roped me into a little waitering. I packed, food shopped, organised a mail drop and caught the 1.30am Greyhound to Atlanta where I arrived at 4.30am this morning, tired and sore. Enjoying the hospitality of Hiker X, a previous PCT hiker and Sami who are looking after me today and Swiss Miss who is going to run me on a few errands. I hope to start walking 2,200 miles north tomorrow. The Start! 2,168 miles to go then . . .